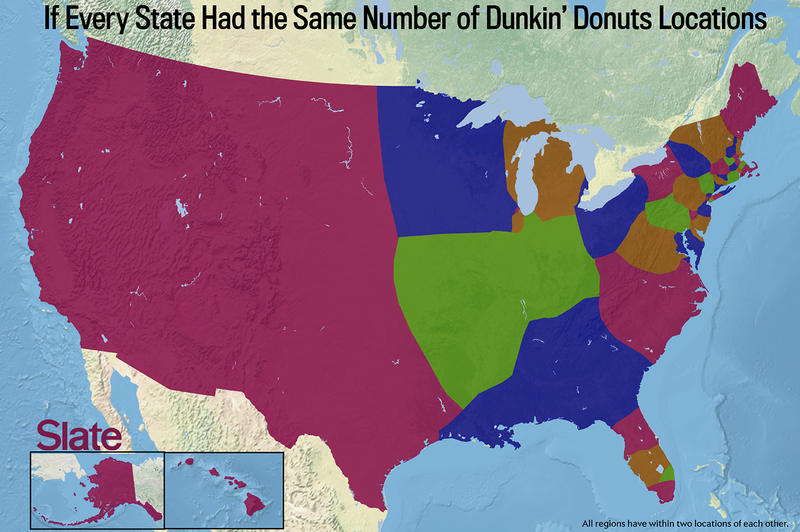 Dunkin’ Donuts map: What America would look like if our state borders were based on fast-food density. 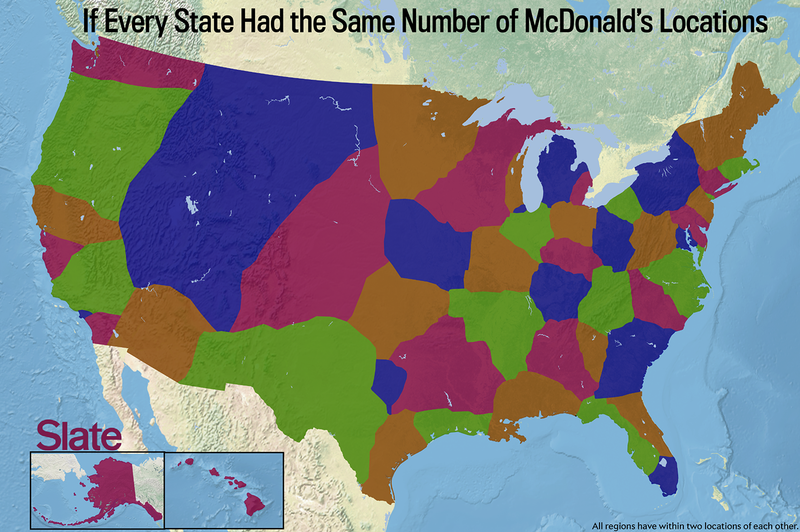 What America would look like if our state borders were based on fast-food density. 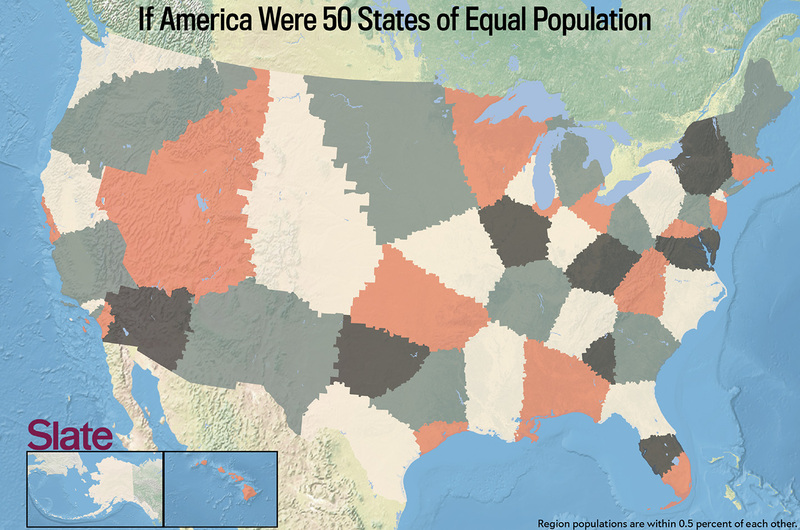 On Monday, I divided the United States into 50 states of equal population. On Tuesday, I rearranged the nation’s boundaries based on where baseball players were born. Today, I’ll be looking at a topic that’s dear to my heart, if not my heart health: regional fast food. Data from Menuism. Created by Ben Blatt. Click the button below to animate. The data for this map comes from Chick-fil-A. It only includes restaurants that still exist—shuttered Chick-fil-A locations are not included on the map. Today, 11 percent of all Chick-fil-A stores are in the company’s home state of Georgia. This makes Georgia the state with the second-most locations (Texas is home to 16 percent of the company’s stores), but Georgia remains the per capita leader (one Chick-fil-A per every 48,000 residents or so). Other chains that have grown from local operations to nationally recognized brands still maintain strong regional roots. Dunkin’ Donuts has expanded rapidly in the last decade or so, but its footprint in the Northeast remains disproportionately large. In Massachusetts, there is a Dunkin’ Donuts for every 6,500 people, while there is one Dunkin’ Donuts for every 12.7 million people in California. Dunkin’ Donuts has more locations in New York and New England than it does in the rest of the country combined. Jimmy John’s was founded in Charleston, Illinois, in 1984. It has since grown to more than 2,000 locations in 43 states, but today there are still more Jimmy John’s stores per capita in Illinois (one per 51,000 people) than in any other state. 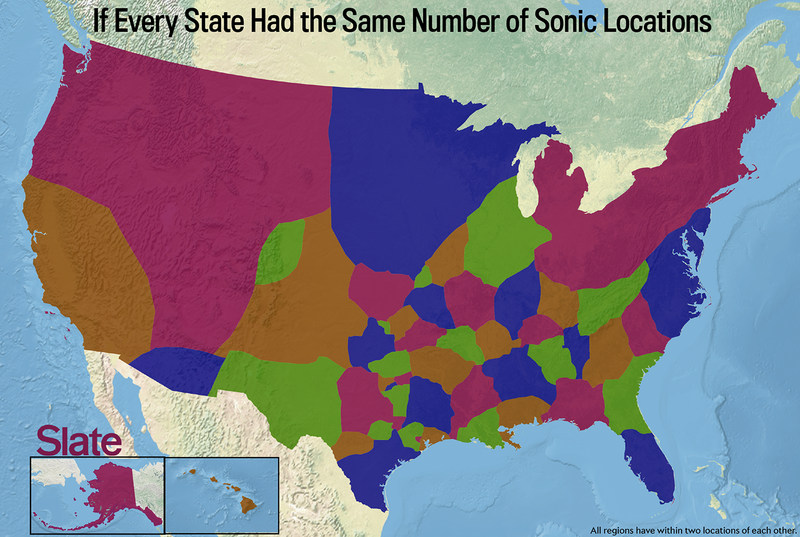 Sonic, founded in Oklahoma in the 1950s, is still more highly concentrated in the Sooner State than any other, at a rate of roughly one per 15,500 residents. Other chains, however, have outgrown their regionalism. Subway, which started in Connecticut in 1965, is now dispersed pretty evenly across the U.S.
Today, five states edge out Connecticut in locations per capita—Ohio, Wisconsin, Nebraska, Wyoming, and Indiana—and 38 of the 50 states have a rate somewhere between one Subway store for every 9,000 to 15,000 residents. Ben Blatt is a Slate contributor and author of Nabokov’s Favorite Word Is Mauve. Follow him on Twitter.